Do you fancy a new challenge to raise funds for Tŷ Gobaith? Choose from sky diving, cycle rides, golfing days or a half marathon to name a few. Or for the less high adrenalin canal walks or helping to pack bags at the local supermarket. Why not do your bit to help this worthwhile local charity. Click here for further details. 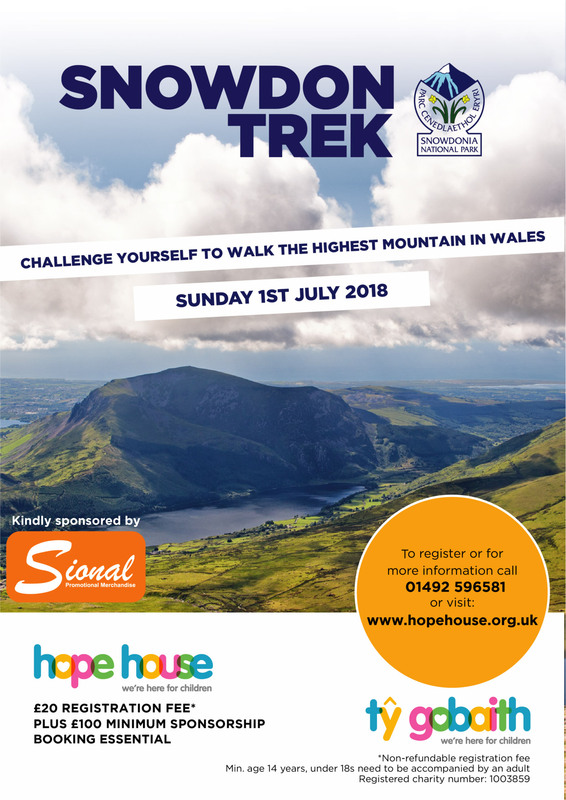 This family friendly challenge will take place on Sunday 1st July 2018 and will follow the Llanberis path on a 9 mile walk to the summit. One of the most popular routes up Snowdon, the Llanberis path heads up the northern side of this iconic mountain, also alongside the famous railway that also leads to the summit. The duration is approximately 7 hours to the summit and back. For further information and a poster, please CLICK HERE. A student from the School of Medical Sciences is raising money by walking from Cardiff to Conwy for Ty Gobaith at the end of March. Many thanks to ELCOS staff who collected £42 in lieu of sending Christmas Cards and also thank you to Student Services staff who rasied £70 too. On Monday the 4th of July, 7 staff and a dog trekked up Snowdon to raise funds for Tŷ Gobaith. Unfortunately their hope to at least get to the top dry didn't happen but a good time was had by all anyway. See below some pictures from their trip and maybe you'd like to join us next time. Many thanks to Emlyn from SBS for being team leader. Update: Joe raised in excess of £1,000 through his JustGiving site and local collection boxes, he is grateful to everybody that donated, and is now having a well earned rest after his massive solo trip. Joe Patton, our previous Occupational Health Practitioner left the University nearly 2 years ago but is still cycling his way to raising funds for Ty Gobaith. 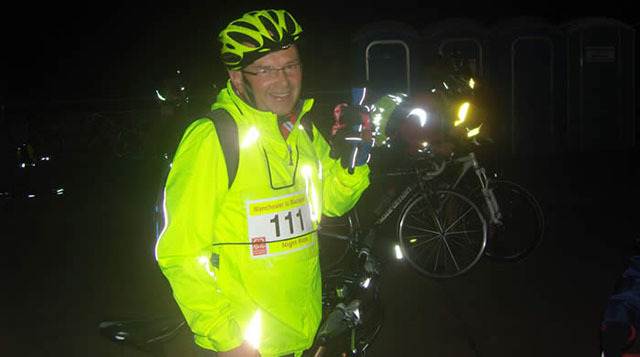 “It has been 18 months since retirement and apart from my love of dogs, baking and cycling, I still do whatever I can to support the Bangor University’s adopted charity, Tŷ Gobaith. On May 4th 2016 I am raising funds for Tŷ Gobaith through a solo and self-funded bicycle ride from Lands End to John O’Groats, a distance of roughly 1000 miles. handmade arts, crafts, jewellery and more for sale. Well done to staff from Canolfan Bedwyr who wore Christmas Jumpers for a day before Christmas and raised £41.70 for Ty Gobaith. Ty Gobaith had a day of zip wire fun on Sunday 19th of July. 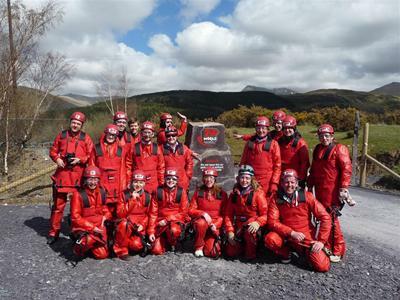 Mary Evans from Bangor Business School and Mannon Briggs, Halls of Residence, recently took to the skies at ZipWorld to raise money for Tŷ Gobaith. 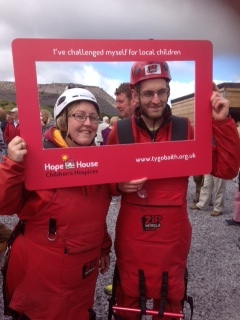 Both thoroughly enjoyed the experience and would like to thank everyone who sponsored them. Mary raised a total of £260 and Mannon raised £250. Many thanks to all in the Estates and Facilities department who raised £66.50 from a raffle. 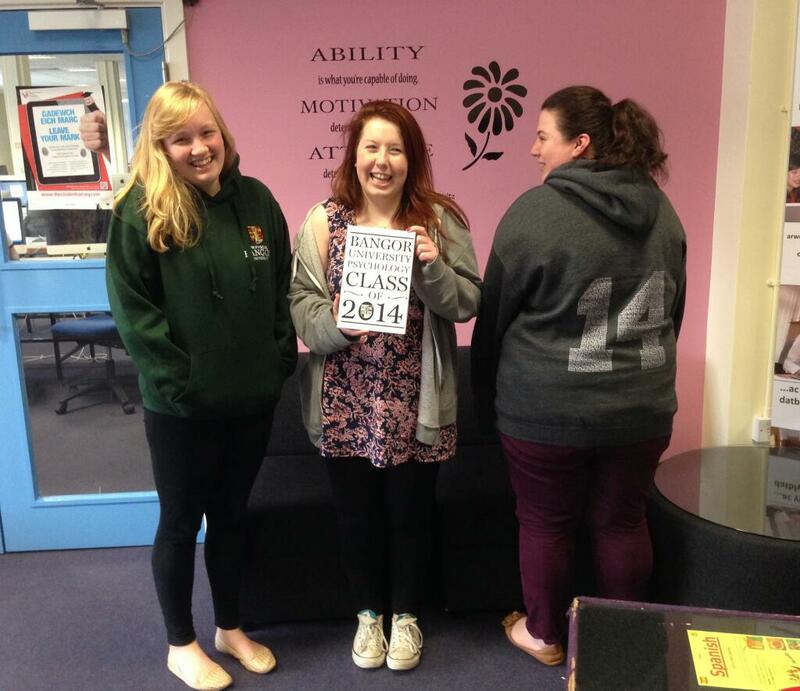 Pictured are three of of the Psychology students, with the 'Class of 2014' Yearbook and Leavers' Hoodies – 69p from the sale of every yearbook was donated to Ty Gobaith, rainsing £62.79. 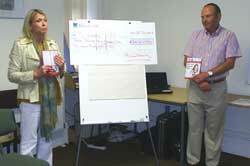 To see a picture of the handover and further details and thanks to staff please click here. 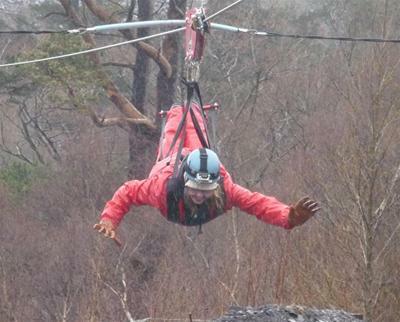 Following on from the successful charity abseil by TEAM CHEMISTRY (Bangor University) in 2010 they have decided on their next charity challenge and are taking on the challenge of the longest zipwire in Europe - North Wales newest adventure based in Penrhyn quarry Bethesda. The challenge took place on Sunday 21st April 2013. The team traversed the "Little Zipper a 450m zip line down to the quarry before taking on the "Big Zipper" a one mile long zipline 700ft above the lake travelling at speeds of up to 75mph. 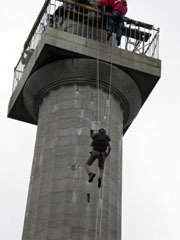 This really was a challenge of a lifetime for many of the team who faced their fear of heights. Mike Beckett, Michael Brooks, Arthur Connell, Sanjay Ghosh, Siobhan Jones, Srikanth Kommanboyina, Lorrie Murphy, Emily Oughtibridge, Farah Oulaidi-Lamiable, Annwen Owen, Igor Perepichka, Gwenda Pritchard (SSHES), Dotsha Raheem, Abbi Roberts-Parry, Tracey Roberts, Stevie Scanlan, Bradley Starkings, James Stewart, Adrian Thomas, Vera Thoss, Anna Tochwin, Cyan Williams. 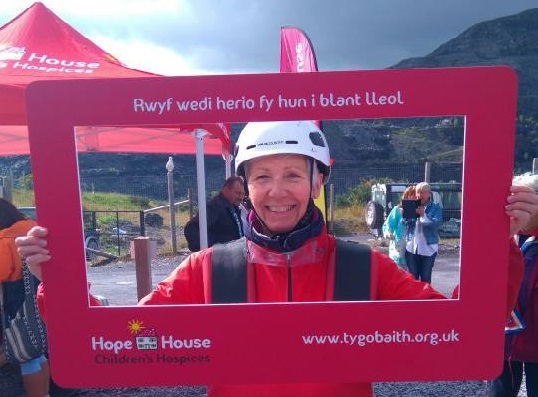 On Sunday 14th of October, 9 staff members or family members of staff abseiled 110 feet down the Marquess of Anglesey’s Column to raise money for Ty Gobaith's childrens hospice. 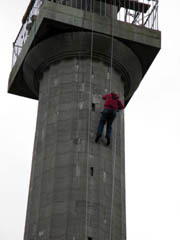 To date nearly £900 has been raised by the brave abseilers, well done everyone. The annual University sponsored walk up Snowdon to raise funds for Ty Gobaith took place on Thursday September 6th. To see pictures from the day click here. 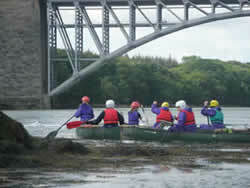 Please visit our site for details of previous trips and a sponsorship form http://active.bangor.ac.uk/walking.php.en. On 28th of July, Hazel Frost from the School of Psychology and Emma Wynne-Hughes from Bangor Business School trekked up Kilimanjaro via the Machame Route. They raised money for the Darren Rhys Frost Memorial Fund and Ty Gobaith, raising a massive £1,152. Hazel visited Ty Gobaith in the Conwy Valley in September and in recognition of her efforts Ty Gobaith have a dedictaed leaf or star on their Tree of Hope. Also pictured is the lovely setting of the Hospice looking out over the Conwy Valley. 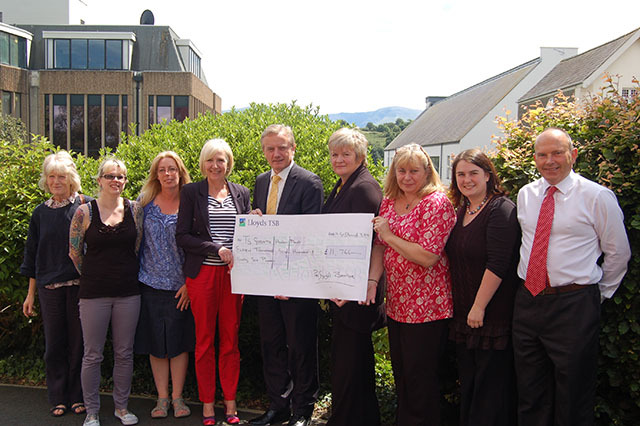 Thursday 12th of July 2012 saw a handover of monies raised in the last year by staff and students. The Students' Union Dance Club have raised a massive £1,000 for Ty Gobaith through a sponsored dance, a sponsored walk up Snowdon and through donations and refreshment sales at their dance shows. Many thanks to all who took part. 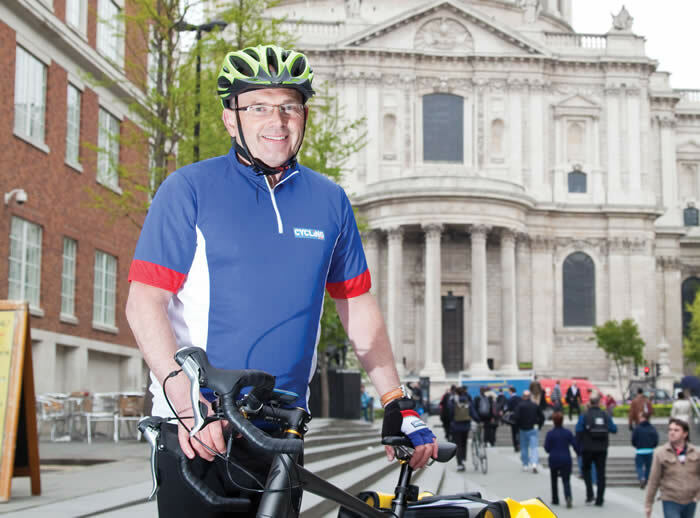 On Thursday May 3rd Joe Patton cycling alone for 250 miles from St Pauls in London to the Notre Dame in Paris, along the Avenue Verte. To see a report and pictures of Joe's adventure click here. 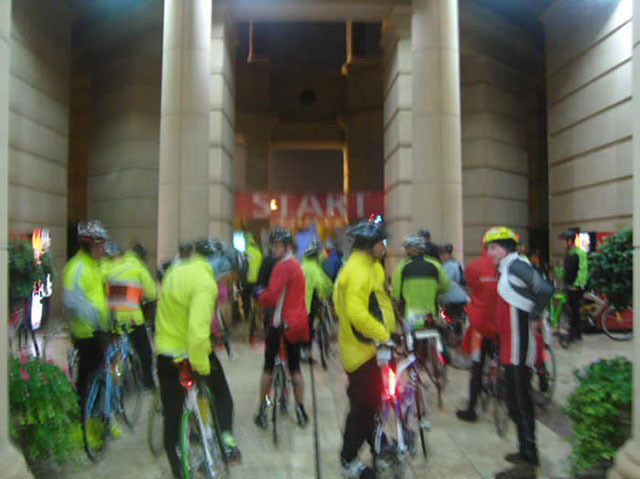 Congratulations to Joe Patton who did his first night ride from Manchester to Blackpool on September 18th 2011. Joe braved the rain starting from the Trafford Centre at 1am and collecting his medal a few hours later on the Golden Mile in Blackpool. Many thanks to those who sponsored Joe and helped him raise £110 for Ty Gobaith. Friday 9th September saw 11 past and present members of staff battle the strong winds and fog to climb to the summit of Snowdon, and together they raised a brilliant £615.20. For further details click here. Over the past 18 months over £12,000 has been raised by Bangor University to help support the quality of life for local children with life limiting illness and assist with the psychological care of their families. On Wednesday July 28th 2011 the handover of £3414, raised between January and June of this year was marked by a gathering of Ty Gobaith supporters that was attended by Helen Wyn, pictured below, from Ty Gobaith. In acknowledging our fund raising efforts Helen described the ways donations are used for local children, including: hydrotherapy, physiotherapy, music therapy and nursing care. Support for families includes bereavement care and support groups. 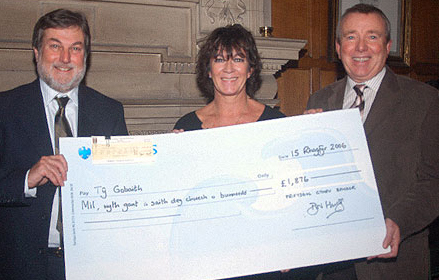 Ty Gobaith is a registered charity. 95% of the money that they need to provide a service is donated by the general public or from workplace fund-raising efforts. 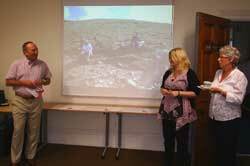 Those who attended the handover in June were treated to a slide show of activities organised over the past 18 months. These included an ascent of Snowdon (pictured), abseiling down the Marquess of Anglesey’s column, a Student v Staff football match, 2 weight loss challenges, a Bangor to Aberystwyth University bike ride and our most recent canoe challenge from the Conwy Centre at Plas Newydd to Bangor Pier that was sponsored by ‘Posturite’. In addition to organised events, monies have been raised through the staff lottery. There are presently just over 400 members of staff in this lottery and more people are encouraged to pay £1 a month to join. 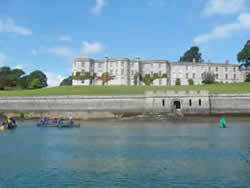 On Sunday June 19th 2011 a group of 12 Bangor University staff and family members set out to paddle for 2 hours from the Conway Centre at Plas Newydd to Bangor Pier, raising money from sponsorship for the Ty Gobaith children's hospice in Conwy. For further details click here. Friday 21st of January 2011 saw a challenge football match between the staff and students of the School of Chemistry. The lunchtime match raised £62.23 with staff narrowly losing 3-4 to the students. On December 2nd 2010 we were able to hand over a cheque for £7,410-86 to support the children and care provided by our adopted charity, the Ty Gobaith children’s hospice. Hazel Frost, Joe Patton, Lorrie Murphy and Mary Evans are pictured handing the cheque over to Katrina Lawson from Ty Gobaith. 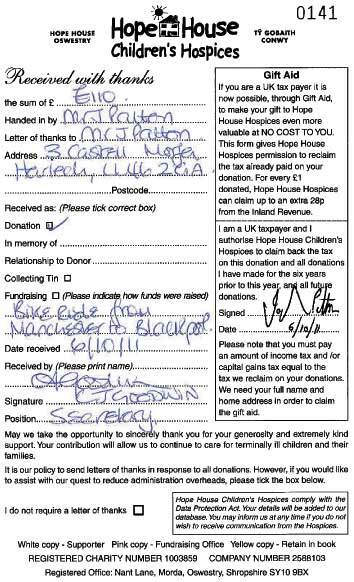 The money has been raised from various sources. Over 400 members of staff joined this year’s lottery, each contributing £1 a month from their salary. Whilst some people are fortunate winners of our monthly draw, the real reason for joining the lottery is to support Ty Gobaith children’s hospice. The lottery raised £3000. 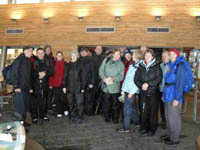 Our other funding raising events have included a Snowdon walk. This involved nearly 20 staff representing the Management Centre, Finance, Health & Safety Services and academic departments. The walk took just over 5 hours on a bleak, cold and very wet day and raised £773. The most recent event involved just over 20 staff who sacrificed their Sunday off to abseil down the 110ft Marques of Angelsey column, supported by friends, family and work colleagues. The departments represented included Canolfan Bedwyr, Chemistry, Computer Science, Health & Safety Services, Maes Glas, Psychology and the Finance department. 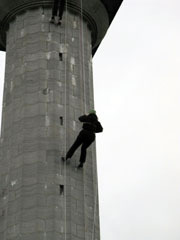 The abseil raised £3,410-86. Thank you for your ongoing support to this worthwhile cause. 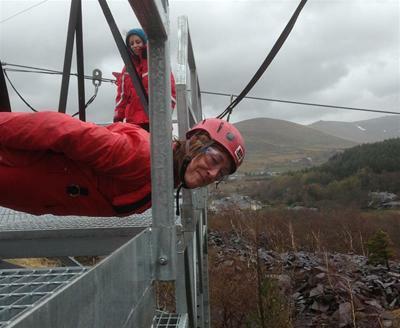 To see pictures from October's abseil click here. 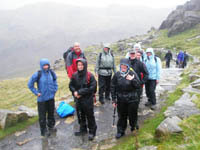 On Friday 10th of September 2010, 16 members of University staff completed a sponsored walk up Snowdon. 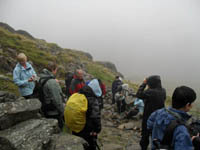 The weather on the day was extremely wet, but they bravely made the summit and descent in a good time. In total they raised £618. 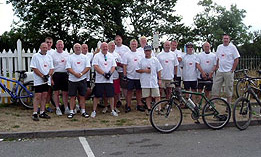 The 107 mile ride took place in May 2010 and took just over 10 hours to complete. 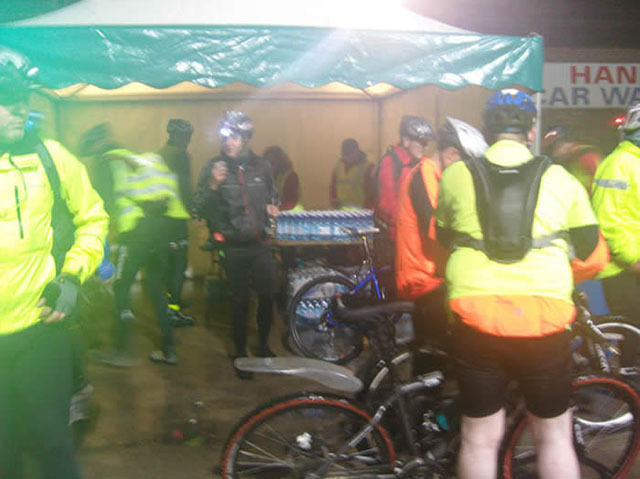 The ride raised over £100 for the Ty Gobaith Childrens Hospice, well done Joe. 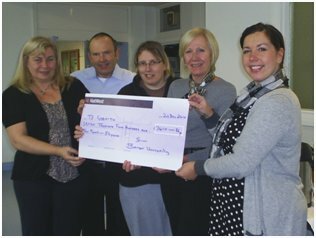 Well done to staff on a successful weight loss challenge in 2008 which raised £1002.80 for Ty Gobaith, and £671.10 in 2009. 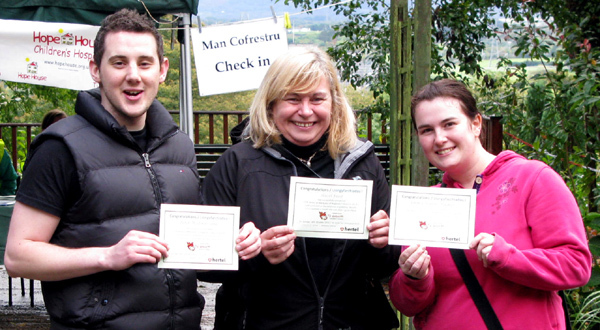 On Friday 18th of September 2009, a number of University staff completed a sponsored walk up Snowdon. The walk enabled 15 members of staff to take on the challenge of the Rhyd Ddu route, which they started walking at 9.20am and they reached the summit at 12 noon. The weather was wonderful and allowed panoramic views of North Wales, and after spending an hour in the visitor's centre for refreshments, rest and relaxation they began a slow descent, reaching ground level at 4pm, via the slightly longer Snowdon Ranger route, and recovered with a well earned drink at a local hostelry. The event raised £785.70 for Ty Gobaith. It was an excellent start to the fundraising with generous University staff and students raising £938.00 by donating £1 to park in all the University car parks. The University then matched the money making a grand total of £1876.00. Pictured receiving the cheque from the Vice Chancellor, Professor Merfyn Jones and the Pro Vice Chancellor for Widening Participation and Welsh Language Strategy, Meri Huws, is Mr David Williams, an Ambassador for Ty Gobaith and a member of the University Council. Each year Raymond Tugwell organises a sponsored walk down the Ogwen Valley providing a wonderful picnic for all the walkers at the half way stage. This year Raymond donated £610 to Ty Gobaith.